Is there a link between your emotional and physical chronic pain? Pain: Understanding the perpetual cycle that links psychological and physiological concepts of chronic pain. Aside from the rare disorder of congenital insensitivity to pain (less than 20 cases reported in scientific literature), neither you nor I are immune to the susceptibility of chronic pain. We enter this world screaming in shock – presumably from the discomfort that arises from the jolt into an unknown universe and the want to go back to the place of comfort. Though there are physiological ailments to this sense of pain, more so it is an emotional affliction from the physical loss of connection that brings about fear and uncertainty. Which brings about the thought that within an instant of being placed in the care of the mother, generally speaking (and so too in comparison to many other mammals), the fear and uncertainty that brought about the pain, ceases; in true connection we are comforted. What is most remarkable about the “pains of birth” is that it is a grand analogy for the biological workings of the recurrent pain conundrum that many face throughout their lives – AKA chronic pain. Though quite often it is not as obvious to us as it may seem, there is a perpetual link between physiological pain and emotional pain whereby one initiates the other and essentially wreaks havoc to our holistic wellbeing. There is either a physical ailment that creates an inability to connect or reconnect within us and with others, and thus an emotional affliction; or an emotional affliction that creates this same type of disconnect and thus (thought quite often the links are gone unnoticed) a physiological ailment. Further, these interlinked concepts bounce of one another, each perpetuating the other until, in extreme circumstances, there is either a chronic emotional disconnect by way of a mental illness (i.e. depression or anxiety), or a chronic physiological disconnect by way of a chronic pain disease (i.e. arthritis, fibromyalgia, and even Myofascial Pain syndrome). How does this pain concept relate to me? The best way to make sense of this concept is to consider the definitions of both pain and stress – all things considered, stress being the underscoring ailment or affliction and causation. So too, by taking these definitions and concretely conceptualizing them through one of the more common physical ailments of chronic pain (i.e. back pain, neck pain, headaches, joint pain, and nerve pain), the perpetual cycle that links psychological and emotional concepts of pain becomes clearer. Abdallah & Geha (2017) define pain as “…the collection of emotional and sensory perceptions, as well as motor behaviours, resulting from the activation of the nociceptive pathways in response to harmful stimuli” (pp. 1-2). Abdallah & Geha (2017) define stress “…broadly as a process by which a challenging emotional or physiological event or series of events results in adaptive or maladaptive changes required to regain homeostasis and/or stability” (p. 1). With these definitions in mind, along side the chronic ailment of back pain (remarkably in 2011, ‘back pain & problems’ were the third leading cause of total disease burden and injuries in Australia), we can concretely understand that with a repeated stress overload, for example frequently lifting heavy objects incorrectly or even poor posture, our bodies advise us of the overload, or that something isn’t quite right, through pain. If we choose to ignore this signal, or if perhaps we hold onto the notion “no pain, no gain”, then our bodies go into a state of change whereby other body tissues are signalled to compensate. At the same time, both the hypothalamic–pituitary–adrenal axis (HPA Axis) and white blood cells are being driven by Corticotrophin-releasing hormone; thus respectively, the release of the stress hormone cortisol and stimulation of inflammation as a protective mechanism is initiated (see here for further explanation on Corticotrophin-releasing hormone as well as the connection to these systems during pregnancy and birth). 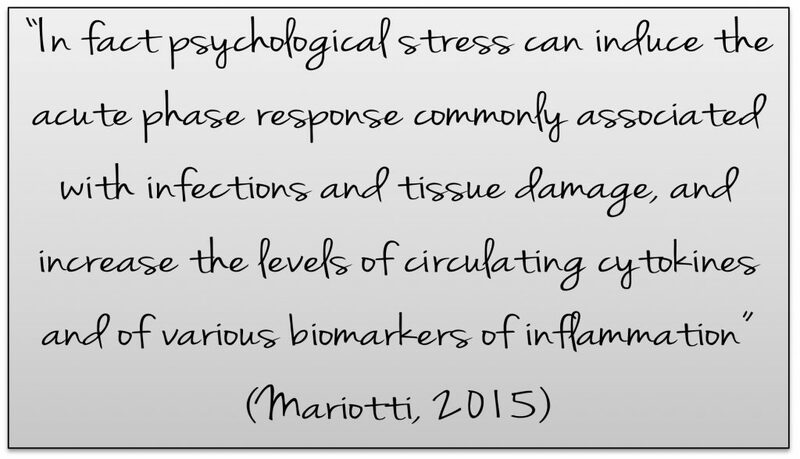 Furthermore, should we continue along this path, both cortisol and inflammation continually increase causing our bodies to go into a chronic state of physiological stress – our neuroception, sensory, and perception systems become over stimulated and maladaptive. What this means is that the additional sensation of pain now drives our neural circuits to become more hyper-vigilant, causing anxiety about how to handle prevailing situations. This hypervigilance then, once again, increases the stress hormones and inflammatory responses, which again increases the both the psychological and physiological concepts of pain. and without treatment will continue. For example, should the back pain become debilitating, further affliction occurs due to the sense of disconnection of mind and body caused by the emotional disconnect from regular interpersonal communicative activates such as work, sports, leisure, etc. This cyclic pain conundrum is very real, very perpetual, and, as you would know if you suffer any type of chronic pain – in desperate need of treatment. Further, it cannot be negated that although we have mostly focused on the cycle of physical stress, the same perpetual conundrum can begin with an emotional overload (for example an overwhelming amount of work and the feeling that there is too much to do and too little time); this is because the body’s response to emotional affliction is the same as that to a physical ailment. Meaning: our bodies go into the abovementioned state of compensation-based change no matter what type of stressor is involved. How do I approach pain relief? We will be discussing five ways, both physical and emotional, by which you can attend to any pain ailment or affliction. Posture, balance, and body alignment in conjunction with strength and relaxation has been proven as an effective chronic pain remedy through many studies on the effectiveness of yoga in multiple conditions of chronic pain. Our body’s natural ability to normalise hormones, and regulate the stress response is an innate way by which we heal – it is only when the stress hormones are deregulated or over stimulated that the bodies healing capacity turns on itself – imagine a tree, water the seed too much and the tree will not grow! Therefore, by practising particular yogic techniques that focus on the awareness and moderation of internal and external stimuli as well as sensation we become conscious in a non-judgmental manner; this allows us to affect self-compassion as well as to experience the perception of pain differently. Releasing blocked energies has been used in traditional medicine for centuries. Comparatively in modern medicine there is an established field of myofacial release that focuses on the release of myofascial connective tissue restrictions at specific points. As has been established, our bodies hold pain in many ways – including within, and perhaps most relative to, the interconnected system of the facia (See here for facia definitions). As such the process of myofacial release allows us to loosen the tension, restrictions, pressures, and ultimately the pain caused from blocked energies that have been stored within our body. Furthermore the process of myofacial release encourages the innate healing capacity of the body. Increasing vagal function and creating perceptual awareness is an essential element in pain management. As previously discussed the HPA axis is vital in the stress and pain response, as is the involvement of our bodies proprioception sensory system and the sensory neurons that give us a place/time/space continuum – aka our sixth sense or intuition. Many studies again have proven the effectiveness of meditation as a form of pain treatment and management as it relates to an increase vagal tone and sensory awareness. Focusing on contemplative and soothing practices that generate feelings of safety and internal regulation have been shown to increase the strength of the parasympathetic nerve network that connects the brain with the organs, thus the ability to perceive and receive external stimuli and steady response accordingly. As meditation is based in these contemplative practices this shows us that meditation is an essential element in pain treatment. How on earth do I do this? As aforementioned, the practise of yoga and mediation is the key to breaking the recurrent pain conundrum. Throughout the year we hold many retreats that focus on treating many physical and mental ailments in a holistic manner . These weekends combine evidence-based knowledge with traditional wisdom in combination with Clinical Yoga Therapy, Meditations, as well as specific processes for holistic pain rehabilitation. *As mentioned, the practise of yoga and meditation on a regular basis is the key to managing pain effectively. Yet, it cannot be misunderstood that this is the only treatment. Yoga and meditation are very effective treatments, however without proper instruction, and should the pain be chronic, without appropriate medical attention, the perpetual cycle will not be remedied. What this means is seeking modern medical opinions in conjunction with Yoga Therapy Appointments. This combinatorial approach ensuring that your holistic wellbeing is not negated in anyway.